The church of Saint John the Evangelist stands on the Masham road just outside the Wensleydale village of East Witton. The main village slopes gently uphill on both sides of the wide green under the gaze of the grouse-driven moors above. Between the village and the church lie The Blue Lion Inn and the detached dwelling that was the vicarage. The vicar in 1858 was the Reverend William Thomas Garrett, M.A. and J.P., a native of Tynagh in County Galway. His wife, Anne, however, was a Yorkshirewoman, though not from the Dales. She was a Horsfall, daughter of a Bradford worsted merchant (John Horsfall, who was the first manufacturer to introduce steam power to Bradford). With Thomas and Anne were two children, six-year old Thomas, born in Manningham, and four-year old Mary, born in Leyburn. On the 13thof April the family grew by one, as John Raymond was born. Many of the boys covered in these stories were educated at major public schools, and enjoyed officer training at Sandhurst, but John stayed in Yorkshire, boarding and studying at the small school run by the vicar of Sherburn in Rydale. Then he joined the army directly, with a commission in the 60thregiment, the King’s Royal Rifles. In late 1880 the Rifles were posted to South Africa. By then sister Mary had been married, to John Michell of Forsett park near Richmond, and widowed, as her husband died at his Scottish estate near Aberdeen. They were married at Crakehall, just west of Bedale, as a few years previously father William had taken up the living there, residing in the adjacent hall (a step up from the vicarage). Meanwhile, in distant South Africa, the British had annexed Transvaal, the Boer republic stuck in a quagmire of military defeat and financial ruin. The British authorities there, encouraged by the imperialist Colonial Secretary in London, Lord Caernarvon, were aiming for a South African federation, following the recent example in Canada. Unsurprisingly the annexation was not greeted with universal acclamation, and by 1880 the opposition was becoming vocal, culminating, on December 13th, in a declaration reconstituting the Boer South African Republic in Transvaal. Within a couple of days the British forces scattered around the Transvaal were under siege. The First Boer war had begun. 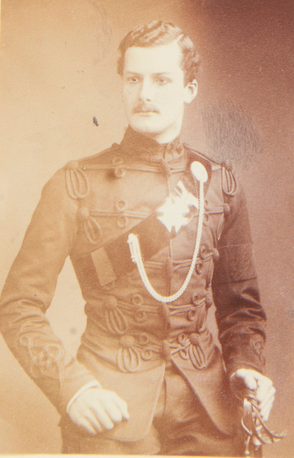 The British, under Sir George Colley, a staff officer who had never before commanded a force in the field, greatly underestimated the Boers’ capabilities, and did not understand their military tactics. Highly skilled horsemen, and expert marksmen even on horseback, the Boers refused to participate in the more static conflicts preferred by the British. Their guerrilla tactics, backed up by their knowledge of, and use of, the terrain, caused the British serious problems. The Boers had already had the better of conflicts at Bronkhorst Spruit and Laing’s Neke when Colley felt forced to take offensive action in the first week of February, 1881. Coley’s main force was at the military camp of Mount Prospect, north of Newcastle, but in that first week of February his supply wagons were being attacked and pillaged, supplies which he needed were he to relieve the various sieges elsewhere. To protect his supply route Colley sent out a force of infantry to clear the dusty dirt track to Newcastle, and to set up protective positions on the route. As the force approached the River Ngogo the first of these posts was established; a company of green-jacketed riflemen, with some native troops, a few mounted infantry, and two guns. The remainder of his troops forded the drift and moved on up the hill on the other bank, where, at the top of the ridge, a large force of Boers was spotted. Colley took up defensive positions, and at noon the fighting began. It should have been more equal than it was, had the British force been able to cope with the Boers’ method of warfare. While their infantry sheltered behind rocks and folds in the land, the Boer horsemen swept in, shot, then wheeled away. The more cumbersome British mounted infantry, outnumbered and less skilled, could not prevent these incursions, nor could they effectively the disrupt the marksmen in the rocks. By half-past two Colley fearing that the Boers would soon be able to storm his position. He sent one of his staff, a Captain McGregor of the Royal Engineers, with a message to Colonel Ashburton of the 60th, send out a company of his riflemen to prevent this. Ashburton had only one company, I Company, in reserve, under Lieutenant John Garrett. Captain McGregor assumed command and they set out to dissuade any Boer attack. They seem to have advanced further than needed to, and reached a position only fifty yards short of the Boer marksmen. McGregor was shot and mortally wounded, and Garrett, far from the fells of Wensleydale, was shot and killed. Of the company that went out, probably around seventy men, only nine were not killed or wounded. The foray seems to have achieved its objective however. As heavy rain began to fall on the green-jacketed bodies of John Garrett and his men the Boers withdrew. In the downpour, and under cover of nightfall, Colley retreated over the rain-swollen river, which was in such a state of spate that a further eight men were lost, swept away and drowned. In total the British lost seventy-six officers and men, their bodies retrieved and buried at Fort Amiel in Newcastle – a memorial still stands next to dry-stone wall there. The Boers lost eight men killed; they were buried at a nearby farm called Gedhoutboom, which I can find no trace of. Ingogo was not the last British disaster of the war. Three weeks later, on a hill called Majuba, Colley’s army was overrun, with the loss of ninety men, including the General himself. The Boers had one man killed and five wounded. Enough was enough. On March 21st peace was agreed, and on August 3rd Transvaal had its independence restored, the sop to British imperialism being a limited control of Transvaal’s foreign affairs. By 1884 full independence had been established, but the republic was to remain taut with tension until 1899, when the Second, and much more ferocious, Boer war broke out. What of the family John Garrett left behind? Father William died at Crakehall in 1884, with mother Anne following ten years later. Her executor was John’s elder brother, Thomas, retired Colonel of the 16th Lancers. He died in Cairo in 1900. Sister Mary lived on as a widow at Crakehall, surrounded by servants, until her death in 1921. Probate was granted to her cousin James Hugh Eliot Garrett, and she left nearly forty thousand pounds. A healthy sum, but sad that was the last of her line. To the dear memory of John Raymond Garrett, Lieutenant 60th King's Royal Rifles, born at East Witton Vicarage, Thursday 13th April 1858, killed at the Battle of Ingogo, South Africa, Tuesday 8th February 1881, this window is placed. "They shall be mine saith the Lord of Hosts in that day when I make up my jewels (Mal. 3.17)"